House Minority Leader Nancy Pelosi (D., Calif.) is under fire from a number of her Democratic colleagues after another loss for their party in Tuesday night's special election in Georgia. Democrat Jon Ossoff lost to Republican Karen Handel in the sixth district race to replace the seat vacated by Secretary of Health and Human Services Tom Price. Ossoff's candidacy was seen as Democrats' best chance of winning one of four off-year special elections prompted by appointments to Donald Trump's Cabinet, with some Democrats looking at a potential upset as a referendum on Trump himself. Instead, Democrats have spent $35 million on the race in Georgia, another on Tuesday in South Carolina, and two more in Montana and Kansas. With an 0-4 record, Pelosi's colleagues are beginning to question whether more radical change is needed. Rep. Tim Ryan (D., Ohio), an old opponent of Pelosi's, was somewhat circumspect in his criticism, saying that the party needed to reevaluate. "We'd better take a good, long, strong look in the mirror and realize that the problem is us, it's the party," Ryan said while leaving a meeting on Wednesday morning. Ryan contested Pelosi in the House Democratic Caucus leadership election last November. Ryan managed to capture a third of the caucus, a sign of discontent toward Pelosi within the party. Although he would not say if he thought she still belonged in leadership, Ryan did opine that Pelosi's low favorability rating made her a liability for candidates. Pelosi featured prominently in many anti-Ossoff ads, which tended to paint him as her puppet. "It makes it a heck of a lot harder. That approach still has a little bit of punch to it. It still moves voters," Ryan said of Pelosi's prominence in the attack ads. 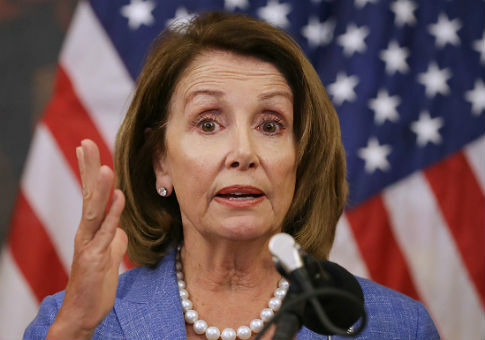 Pelosi held a closed-door Democratic Caucus meeting on Capitol Hill on Wednesday morning. She admitted that the loss was exactly that: "A loss is a loss. It is a setback. Unfortunately, a loss for us. But not good news" for Republicans. Rep. Kathleen Rice (D., N.Y.) was in the meeting. "It was probably one of the more disturbing caucus meetings that I’ve ever been in. And everyone pretty much sat in silence and I'd like to think that they were as shocked as I was that they were hearing the spin that was being put on this loss," Rice said. Whereas Ryan was more circumspect, Rice was explicit: Pelosi needs to go. "We need leadership change. It's time for Nancy Pelosi to go, and the entire leadership team," Rice told CNN. "There comes a time when every leader has to say, ‘For the good of the order and for the betterment of the party, it’s time for me to step aside.' And I wish that that would happen right now. This is not a personal thing. I want to get back in the majority," Rice said in an interview. Rep. Filemon Vela (D., Texas), who supported Ryan over Pelosi in the leadership election, agreed. "I think you'd have to be an idiot to think we could win the House with Pelosi at the top," Vela said. "Nancy Pelosi is not the only reason that Ossoff lost, but she certainly is one of the reasons," he told Politico. Also frustrated with Pelosi's impact on recent races is Rep. Seth Moulton (D., Mass.). Moulton, who let loose on Twitter on Tuesday night after Ossoff's loss, does not know if the party can win in 2018 with the current leadership. "It's not impossible, but it's harder," he said. Even Democrats candidates not in Congress are bailing on Pelosi. Joe Cunningham, running for the House in South Carolina, promised on Wednesday morning that he would not vote for Pelosi for speaker if elected. "The Democratic Party needs new leadership now. If elected, I will not vote for Nancy Pelosi for speaker," Cunningham wrote on Twitter. The Democratic Party needs new leadership now. If elected, I will not vote for Nancy Pelosi for speaker. Time to move forward and win again. One Democrat who has not given up on Pelosi is Rep. Keith Ellison (D., Minn.), the Democratic National Committee's deputy chairman and a rising star in the party's progressive wing. "I think she's one of the best speakers ever, and I am glad to support her," he said. This entry was posted in Politics and tagged Democratic Party, Jon Ossoff, Nancy Pelosi, Seth Moulton. Bookmark the permalink.